What does wine have to do with fighting pneumonia? 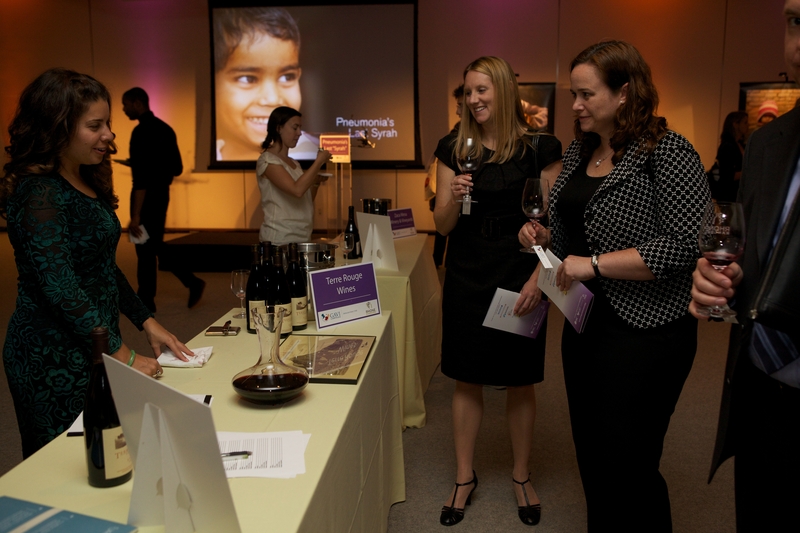 Sampling excellent wines at "Pneumonia's Last Syrah" during the MDG Summit. That column, which analyzed why American Syrah had never taken off despite so much potential, has led to possibly one of the strangest partnerships in global health — a coalition fighting child pneumonia (the International Vaccine Access Center, the GAVI Campaign, the Global Coalition Against Child Pneumonia and the U.S. Coalition for Child Survival) and the Rhone Rangers, America’s leading non-profit organization dedicated to promoting American Rhone varietal wines such as Syrah. I witnessed the partnership in a wonderful event Monday evening in the Times Center here on the first day of the United Nations Summit on the Millennium Development Goals cleverly marketed as “Pneumonia’s Last Syrah,” a wine reception and photography exhibit, which displayed striking images and stories that provided a window into the human face of pneumonia and the burden of the disease. It is the leading cause of death among children under five years of age worldwide, with more than 1.5 million dying from it every year. Vaccines against two of the main causes of life-threatening pneumonia are used throughout the developed world. However, millions of children in developing countries still lack access to these vaccines. Life-saving antibiotic treatment for serious pneumonia typically costs less than one dollar. However, only an estimated one of every five children with pneumonia receives antibiotics. Wine Critic Asimov, who helped ferment this collaboration, spoke at the reception, saying he was humbled to be part of such a significant issue while he usually spent his professional life fretting over such problems as an excess of oakiness in chardonnay. The Global Coalition against Child Pneumonia, made up of more than 100 organizations, will mark World Pneumonia Day on Nov. 12 to bring attention to pneumonia and promote policies that will prevent the millions of avoidable deaths. The Global Coalition suggests five things people can do to take action. One of those things is to buy a case of American Syrah wine during the month of November from one of these producers, and they will donate $10 to provide pneumonia vaccines to children in the world’s poorest countries. This will help save the American Syrah wine industry, but it will produce the even happier effect of saving the lives of children who might have died from pneumonia. I will be buying a case in November. Disclaimer: I won a large bottle of Syrah wine in the raffle at the event but these opinions were in no way influenced by that fact. I was going to write this anyway. « What is required to meet the health MDGs? less getting drunk, more getting healthy! Our Director Bronwen Jones nearly died from severe pneumonia in August 2005 but was saved by lung specialist Gunter Schleicher at Milpark Hospital, Johannesburg. The delerium that can go with pneumonia was misdiagnosed by younger doctors at first, causing a dangerous delay in treatment. She has just had pneumonia again but recognised the symptoms in time. Pneumonia is a danger for all adults who work closely with very sick children as well.